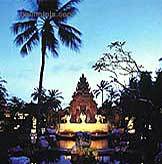 Many of our clients request we reserve accommodations for them prior to their arrival in Bali. The resort hotels in Nusa Dua are conveniently located 5 minutes from our office and provide a relaxing environment at the end of a days frenetic shopping. 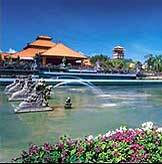 Just outside the gates of the Nusa Dua Resort area are many quality local restaurants and daytime leisure activities. Located in the heart of Nusa Dua, a secluded yet luxurious resort development in the South of Bali, the hotel enjoys a stunning position overlooking the Indian Ocean. Bali's secret mountain Gunung Agung can be tantalizingly glimpsed in the distance and immediately adjacent sits the Bali Golf and Country Club. Ayoda Resort enjoys an extensive range of restaurants, bars, sports and leisure activities as well as meeting facilities. 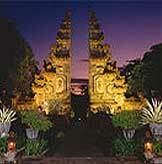 Nusa Dua Beach Hotel & Spa encompass 23 acres of sculpted gardens that provide an oasis of space and tranquility in the heart of exotic Bali. The 380 rooms and suites resort invites you to immerse yourself in the pageantry of one of the worlds most vibrant cultures. A palace of refined luxury and privileged hospitality, this 5-star diamond property has welcomed kings and queens, presidents and prime ministers since its grand opening in 1983. 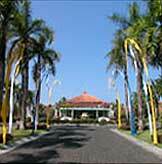 Located in the renowned Nusa Dua resort area between the Grand Hyatt Bali and Bali Hilton, the Inna Putri Bali Hotel's spacious grounds, located directly on the beach, provide terrific access to the best shopping and golf.